Prince of Tennis is an incredibly popular manga in Japan, and there are CDs, stage plays, and even a weekly radio show based on the comic. The good folks at Viz have been putting out the manga volumes for a while, and now they've gotten around to releasing the anime. This is one of the longer series, clocking in at 178 episodes, (and that's not counting the OVA series) so Viz has wisely decided to put out the show in a three DVD set which collects all 13 episodes from the first season. While this show has some charm it's not quite as gripping as other sports anime and lacks excitement both on and off the court. Ryoma Echizen has just started going to Seishun Gakuen, a junior high (7th -9th grades) renowned for its strong tennis club. As a 7th grader, he's supposed to spend his time with the club picking up tennis balls and running drills, but Ryoma is no ordinary pupil. He's the son of Nanjiro Echizen, a former tennis pro who mysteriously quit at the playing while at the top of his game, and an exceptional tennis player himself. The regulars (the members who get to play in tournaments) of the Seishun Gakuen tennis club are not slouches themselves however. Every month the school holds a mini-tournament where the 8th and 9th graders play against each other. The top eight players earn spots on the club for that month. 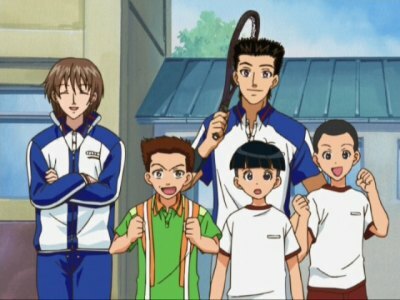 With a little encouragement from Nanjiro's old coach who now teaches tennis at Seishun, Sumire Ryuzaki, the captain of the team, Kunimitsu Tezuka, allows Ryoma to enter the first tournament of the year. Will this young prodigy be strong enough to defeat some of Seishun's best and earn a spot on the team? Anime shows based on sports are some of my favorite series. Shows like Princess Nine and Fighting Spirit are exciting and dynamic but they also have a lot of built in drama. The most successful sports shows, like those mentioned, tell the tale of a likable underdog with a lot of natural ability who has the drive and desire to practice long and hard to become very good at their sport. Prince of Tennis doesn't follow this pattern. While that's not necessarily a bad thing, the areas where this story diverges from the norm make it a rather weak show. First off, Ryoma isn't a nice guy. As the series starts he's cocky and arrogant, and though he has the talent to back it up that still doesn't make him likeable. If someone talks to him he's most likely going to walk by without replying. Though Ryoma doesn't brag about his skill, he does show off a few times and treats everyone around him with quiet distain. Ryoma doesn't need to work to become good at tennis either; he's already at a high level of play. In the first episode he's already a great tennis player, having played in tournaments in America and done quite well. When everyone else complains at how hard the workouts are, he says that they aren't too bad. He's already as good as the best players in the school and that doesn't level much room for growth. Tennis fans will find that some of the shots that Ryoma does are just flat out impossible, and that made it a little difficult for my wife to get into the show. In one episode the opposing player calls a ball "out" which was clearly inside the line. Ryoma doesn't argue, instead on the next point he places the ball in the same spot, but makes it land in such a way that it doesn't bounce. The tennis ball just spins in place right inside the line without rolling or bouncing. Yeah, right. There is also a scene where the players warm up by returning lobs, and every return, no matter where on the court the player is, lands in a bucket of balls on the other side of the court. Its things like that that make viewers wonder if the real tennis that is discussed is accurate. Some of the plots are just as ludicrous. Near the end of this set Ryoma and his friend Takeshi Momoshiro enter the double division of a tournament with their coach's blessing. The thing is they've never practiced as a doubles team at school and when they get on the court it's easy to see that they don't know how to play doubles. Things like that remove the show from reality, and that's not good for a sports anime. The worst thing about this show is the animation. For such a popular manga I was really surprised that the animation was done on the cheap. There is very little movement, and every economy has been taken. 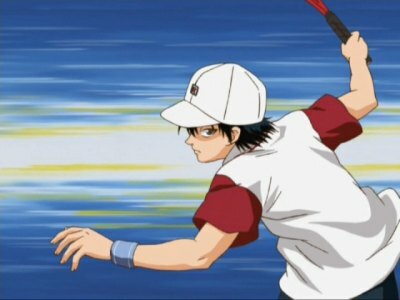 When Ryoma or an opponent enters the court, they pan across a still image of the player. When people are walking, only their heads are shown with a moving background. What's worse is that this show about tennis doesn't show many volleys. Instead of watching the ball go back and forth over the net, the camera will focus on one player hitting the ball. While the background consists only of colored streaks the player will hit the ball, (sometimes they won't even animate that movement and just have a still image in an action pose) and then they cut to the ball landing on the court. Yes, it saves money but it sure looks bad. Even with the ludicrous shots and horrible animation, this isn't a wretched show. It does get better as it goes along, and the people that Ryoma really creams are even cockier than he is, so viewers are always rooting for the young star to win. The show does have some charm, and it's fun to watch Ryoma trounce some creep. Since the show was successful, hopefully the budget for the second season allowed for better animation. This set presents the first thirteen episodes on three discs. The discs come in a fold-out case which is housed in an attractive slipcase. Also included with the discs is a small 'poster' of Ryoma. Viewers have the option of watching this show with the original Japanese soundtrack or an English dub, both in stereo. I alternated between languages and found that I enjoyed the Japanese track better, but not by a whole lot. The English dub is good though I found the voices of the girls to be rather annoying. Neither soundtrack was very dynamic, but then again tennis isn't the most aural of sports. The quality of the audio was fine, though nothing to write home about. There are optional English subtitles, though signs (and written match pairings) are not translated. The full frame image looks pretty good, which isn't too surprising since the animation is so basic and sparse. The lines are tight and the colors are solid. On the digital side things also look good. Aliasing isn't a problem and neither is macro blocking or cross colorization, the flaws that plague animation the most. Overall the disc reproduces the show well, it's just a shame that the animation wasn't better. The extras are pretty slim in this set. The only bonus items are a 15 page character sketch gallery and clean versions of the original Japanese opening and closing. I liked the originals better than the version that comes with this set, but I can see why they changed it. The originals aren't nearly as dynamic and exciting. There are also trailers for four Shonen Jump anime series and a slide with information on how to subscribe to the magazine. The first things viewers will notice is the poor animation that this series has. It is very simple and basic and a lot of corners are cut. If you can get past that, the series is okay but not great. Ryoma is very aloof and comes across as stuck up. Some of the tennis that is played is also ludicrous and could only take place in a cartoon. The show does have some charm though and I don't regret the time I spent watching it. This would make a good rental. 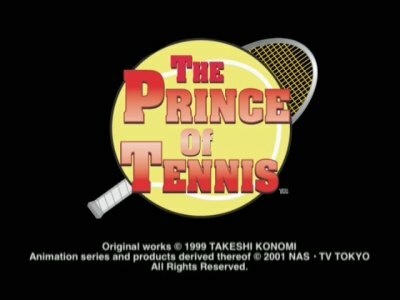 Prince of Tennis is a show that's worth watching if you don't have anything better to put into the player, but one that you won't be recommending to your friends.